Today is the first day of two days pen down strike called by CoSAAp. Thousands of employees working under various department of state government today openly defied the warning issued by the state government by joining phase wise Pen down and tool down strike launched by Confederation of Service Association of Arunachal Pradesh (CoSAAP) on Thursday crippling normal office business. Chief Secretary, Satya Gopal though a press conference and government order on Wednesday warned for pay deduction and disciplinary action against employees taking part in the strike. Many major departments have witnessed agitating employees by abstaining from their call of duty though there were present in their respective seat and office as usual. “I come to office and will be sitting whole day here but I will not be working” said a junior officer at Civil Secretariat. A official in Hydro power department said that we are supporting the demand of the employees but we sincerely attend to our duty. Another official at APEDA said that government should think that we are their son and daughter and they should think of our demand. 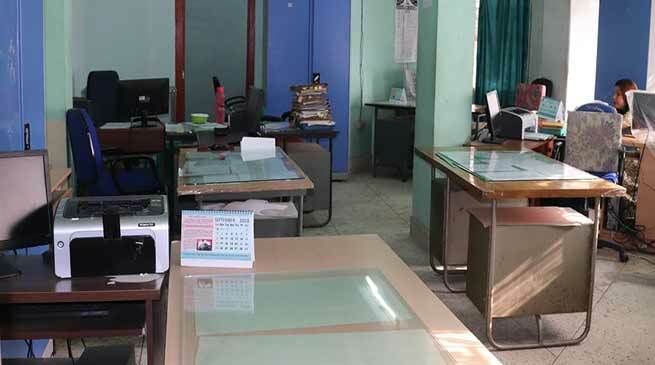 The finance department and budget section and several other branch in the Arunachal Pradesh Civil Secretariat was found emptied only few employees were present. Home Commissioner and Incharge Chief Secretary A C Verma contradicted the media report stating most departments were functioning normally and there were minimal effects, adding the respective Head of Departments are furnishing list of employees on strike so that their salary can be deducted. A release issued by Central Executive Committee said various offices of capital complex and districts have participated in the democratic movement. CoSAAP President Pate Marik and Secretary General Gonya Riba in a statement said that the State Govt. should not adamant to consider the genuine demands of its own employees. At the same time, CoSAAP vehemently condemned and opposed the Govt. order of dated 10.10.2018 to deduct one day salary . The on-going democratic movement of the CoSAAP will continue till its all demands are fulfilled. It is also declared that, in case, any CoSAAP’s leader(s) is arrested or victimized, A JAIL BHARO ANDHALAN will be launch across the State by all State Govt. employees. The release added.